The UPLIFT View Laptop Mount gives you the ability to mount your laptop at a level more conducive to ergonomic functioning. Give your laptop the secure home it needs starting with the UPLIFT View Laptop Mount, which attaches to any UPLIFT View monitor arm. The laptop mount allows you to elevate your laptop screen to more ergonomic viewing heights. This encourages a more relaxed posture while you work and relieves much of the neck and shoulder pain associated with laptop use. Don't put up with less-than-ideal laptop positioning. An external keyboard and mouse is recommended for use when the laptop is raised. Need a full sit-stand laptop solution? Check out our UPLIFT Adapt Mobile Laptop Standing Converter to keep you working. Fits notebooks 10.1" - 17.3"
Supported laptop size Best fits 10.1" - 17.3"
How does my laptop stay in place? The UPLIFT Desk View Laptop Mount has two pegs and adjustable clamps on either side to securely hold your laptop in place. What size laptop will this hold? The adjustable clamps on either side will fit any laptop that is between 10.1" - 17.3" wide. Does this work with MacBooks? This will hold most MacBooks, however it will not hold the MacBook Air, which is too light to engage the cylinder of the arm. How do I type on my laptop while using this? We do not recommend typing on your laptop while it is mounted in the UPLIFT Desk View Laptop Holder. This setup is ideal for someone who uses a peripheral keyboard with their laptop. What adjustments can I make when using this with the UPLIFT Desk View Monitor Arm? You can enjoy all of the great adjustments offered by the UPLIFT Desk View Monitor Arm including height, depth, tilt, and pan. Are the side brackets moveable? Yes, the bottom of the laptop mount is specifically designed to offer a wide variety of placement options for the adjustable side arms. That way you can reposition them to perfectly fit your laptop. Does this include the monitor arm? 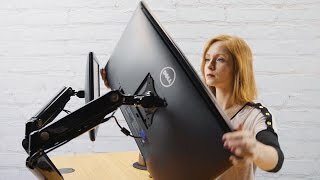 No, an UPLIFT View single or dual monitor arm must be purchased separately as this only contains the laptop mount that fits onto the monitor arm. Will this laptop mount work on any monitor arm with a VESA 100/75 mount? The View Laptop Mount is designed specifically for our UPLIFT Desk View monitor arms, and we cannot guarantee that this mount will work any other monitor arm. The UPLIFT View Laptop Mount comes in black, gray, and white color options. $39.00 List Price: $79.00* The list price is the same as the MSRP (Manufacturer's Suggested Retail Price). It may not necessarily be the price at which the product is sold.